Expression of thought is not only significant for an individual, but there is a necessity for an automated system to get an opinion from it. For a human being mostly it is straightforward to sense the sentiment in the text using the trained mind. Human beings have trained their mind by learning through experiences. An intelligent system should have an automated method that can identify the sentiment in opinions. Although there is a massive advancement in natural language processing (NLP) and machine learning (ML), automated systems still have not achieved 100% accuracy in dealing with sarcasm or finding the polarity of the text. With the advancements in the field of NLP and ML in the last decade, there is a growing need for sentiment analysing systems to help humans in getting an accurate opinion which could subsequently assist them in decision-making. Rosenthal (2017) explains how sentiment analysis involves detecting the positive, negative and neutral expressions in the text. Deep understanding of the speaker is possible through sentiment analysis (SA). Sentiment analysis is a task that is becoming increasingly important for many companies because of the emergence of social media viz. Facebook, Twitter, e-commerce websites and the other trillions of them. Nearly, 500 million tweets/day is a massive data to analyse. Big data related to customer posts/ reviews in social networking, e-commerce websites, etc. is quite unmanageable. An automated system that gives the aggregate inclination of belief and intensity towards entities such as organizations, manufactured items, occasion and their elements is Sentiment analysis / Opinion mining. For the better understanding of the topic/product, Sentiment Analysis is the need of the hour. Opinions are valuable both at personal and professional level. Either we ask for advice, or we get influenced by the advertisement that business organizations put on the Internet after colossal research. Summarizing product reviews using Sentiment Analysis helps in determining the product features that need improvement. Extracting sentiment from product reviews makes it easy for the brand marketing team to reach its customers who need extra care and hence, benefits the business. Feature selection is essential while performing Sentiment Analysis. Feature selection methods will be explained in this chapter. In the supervised learning approach for the Sentiment analysis, text features act as labels and help in classifying the text into different polarities. Ultimately, the sentiment in the text is measured considering different polarities such as positive, negative and neutral. Product reviews are present in text form. SA is a classification task by which text is categorized based on the sentiment orientation. Frequently used approaches in supervised learning for text categorization viz. Naive Bayes, Maximum Entropy and Support vector machine are explained in the discussion section of the chapter. Mostly, sentiment analysis is performed using supervised learning techniques. But, there are few instances where unsupervised learning is preferred. A brief explanation of unsupervised learning approaches is presented in same section. Lexicon based approach is classified as the Dictionary and Corpus-based approaches. Corpus-based method is further divided into semantic and statistical approaches. Lexicon-based procedures are used for lexicon acquisition and developing a corpus which helps in achieving high accuracy in Sentiment analysis. The chapter will explain all the performance measures that are used to evaluate the capability of learning classifiers. While performing sentiment analysis on twitter posts is done using Machine learning approaches, it comes with a drawback that it considers the whole post has a uniform statement and assigns a sentiment score for the entire post. To overcome this issue, Ontology-based technique is applied. It divides twitter post into a set of aspects and assigns sentiment score to each distinct aspect (Kontopoulos et al., 2013). There is a detailed explanation on ontology-based approach in this chapter. 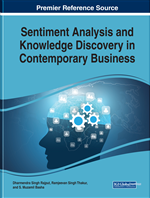 This chapter will comprehensively present the approaches to Sentiment Analysis and will contribute towards better understanding of the procedures.